An exclusive investigation by Breitbart’s Matt Boyle has uncovered extensive evidence that Michigan Democratic Senate nominee Congressman Gary Peters exaggerated and misrepresented his military service record on the campaign trail. Military community leaders, including one of his former commanding officers, said Peters’ military service record jacket, obtained via the Freedom of Information Act (FOIA) from the Department of the Navy and provided exclusively to Breitbart News, shows a man who had a broken service record that was substandard, one of his indirect commanding officers, retired Navy Commander Jim Semerad, said in an interview with Breitbart News. And Semerad is not the only one speaking out. Boyle reports former Rep. Allen West (R-FL), who served as a Lieutenant Colonel in the U.S. Army, is raising concerns about Peters’ record as are Retired Navy Captain Joseph John, the head of the group Combat Veterans For Congress, and the Republican National Committee (RNC) military expert. “Peters said when he was in the U.S. Navy Reserve, he was qualified as an expert marksman in the M16 rifle and 9mm pistol,” the Detroit Free Press reported in February 2013. According to Boyle’s reporting, Peters’ record jacket shows that not only is that not true—but Peters actually made up a new, cooler-sounding firearms qualifications level for his campaign. Peters was never an “expert marksman” in either firearm category because there is no such category of qualification. In reality, according to military records, Peters was a “sharpshooter”—a lower military qualification than “expert”—in both M16 rifle and 9 MM pistol. Perhaps more drastic than his make believe firearms qualifications levels says Boyle, Peters has claimed that he was a Seabee in the Navy. That’s technically not true. He was never a Seabee in the Navy, says Joseph John—a retired Navy Captain who now runs the group Combat Veterans For Congress. “I think about the training that I had as a Seabee — it’s very helpful for me in public service and the U.S. Senate,” Peters told a group of veterans at American Legion Post 426 in Trenton, MI, in early 2014, according to MLive.com. Peters wasn’t really a Seabee, John says—he was an Assistant Supply Officer who was at one point assigned to the Seabee unit. The Seabees are an elite unit of combat-trained Naval engineers who build bridges, living quarters, airstrips and more in combat zones and harsh environments so U.S. forces can move into a region. Technically, Peters can claim he worked alongside the Seabees—but his officer designator code is one for the Supply Corps, not one for the Civil Engineer Corps of which the Seabees are a part. Semerad also has serious issues with how Peters characterized his role for the unit on the campaign trail. For Peters’ claim that he built bridges, Semerad says that’s not true. Peters never built any bridges, Semerad said, and he certainly never was going to be “getting shot at.” He bought steel, concrete and other supplies from behind a desk in an office somewhere so “the other guys”—the members of the Seabee unit he served alongside—could build bridges. “He’s purchasing the supplies for the other guys to build bridges and it’s not likely he’s ever getting shot at,” Semerad said in a follow up phone interview with Breitbart. Because that statement he made about learning to “build bridges while getting shot at” is false, John is calling on Peters to retract it and apologize to voters in Michigan. Ron Dickey, the Democratic nominee for Mississippi’s first congressional district got caught in a similar situation after the Mississippi Democratic Primary. Dickey misled voters in his state about his military record—claiming he was a Green Beret, when in fact he was simply a “food service specialist”—or line cook—for a Green Beret unit. While he hasn’t dropped out of the race—his name is still on the ballot—Democrats in Mississippi, particularly state party chairman Rickey Cole, called on Dickey to drop out. CHQ Editor George Rasley, told Breitbart's Matt Boyle Democrats should likewise call on Gary Peters to drop out of the race in Michigan. Click this link to read the full text of Matt Boyle's exclusive investigation of how Michigan Democratic Senate nominee Gary Peters exaggerated and misrepresented his military service record on the campaign trail. 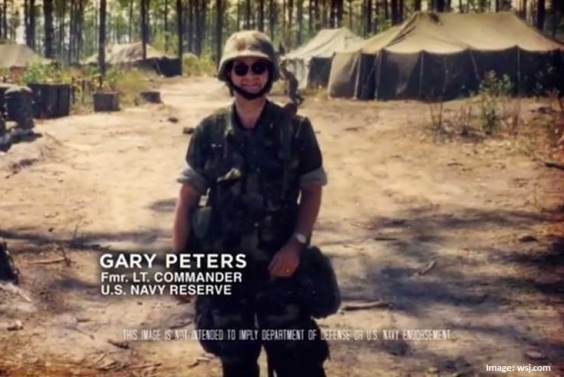 Call the Democratic Senatorial Campaign Committee at (202) 224-2447 and tell them to have the integrity to drop Gary Peters just like the Mississippi Democrats demanded that Ron Dickey drop out when it was discovered he had exagerated his military service record.